Camp Ground aglow for 146th annual Grand Illumination night. 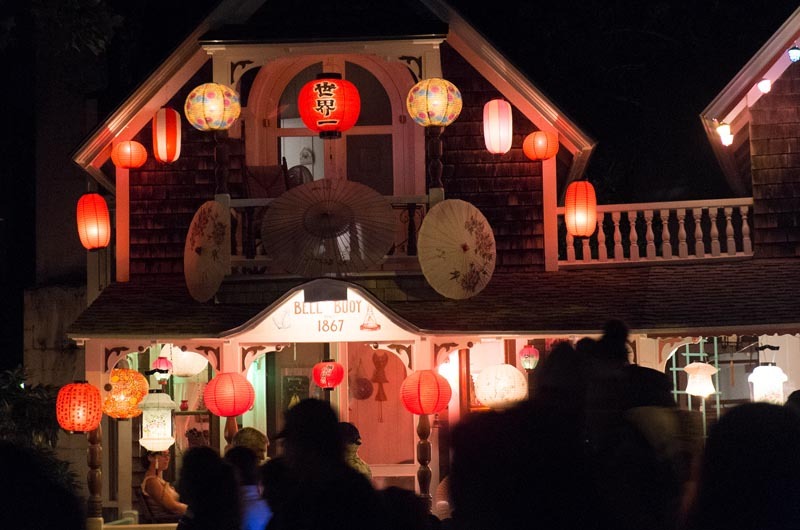 As the sun started to set and the sky darkened on Wednesday, residents of the Oak Bluffs Camp Ground sat on the porches of their brightly colored Victorian gingerbread houses. Facing the Tabernacle, they waited for their cue. 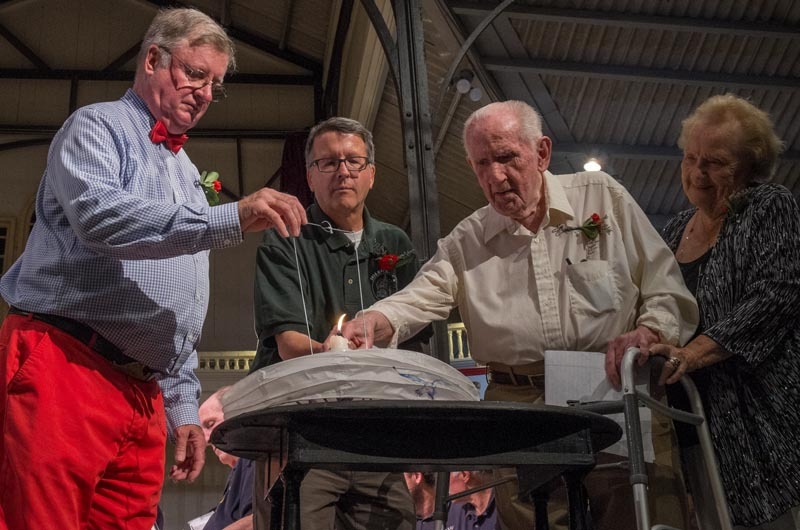 At 8:50 p.m., Bob Cleasby carried a round paper lantern down the Tabernacle’s center aisle and hung it out front. As soon as Mr. Cleasby hung the lantern, it was time for the Camp Ground to light up. Brightly colored paper lanterns bordering the Tabernacle were turned on and in unison, people waiting eagerly on their porches illuminated the paper lanterns hanging from their cottages. By 8:51 p.m., the neighborhood was aglow. It was the 146th Grand Illumination. The Grand Illumination, which takes place on the third Wednesday of every August, is an evening steeped in tradition from beginning to end. The night began with a performance by the Vineyard Haven Band, which was formed in the same year that the Grand Illumination first took place. 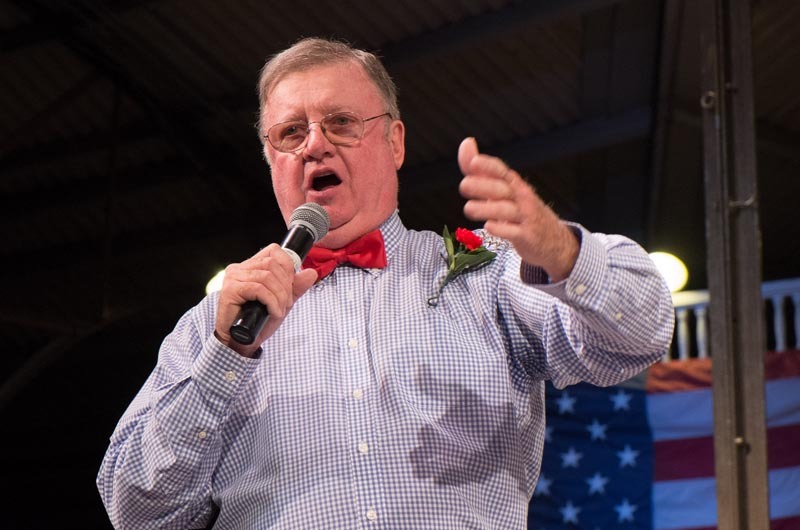 Mr. Cleasby then led a community sing-along, during which he directed the audience as they sang songs such as I’ve Been Working on the Railroad, The Swiss Navy (a crowd favorite), and other upbeat and patriotic tunes. Close to 10,000 people take part in the ceremony and stroll around the brightly decorated neighborhood afterwards, while the band continues to play. Per Illumination tradition, the oldest member of the Camp Ground lights the first paper lantern that Mr. Cleasby then hangs up. This person’s identity is kept secret until the night of the event. This year, the honor went to Bill Nicholson, who is 91 years old. Right before lighting the lantern, he came onstage with his wife Barbara, who has been coming to the Camp Ground since 1930. Mr. Nicholson first came to the Island in the 1940s, when he was a radar specialist at a naval air base here. He met Mrs. Nicholson at Inkwell Beach while she was vacationing with her grandfather. A few years later, the couple married and bought a cottage in the Camp Ground, where they live to this day. Mr. Nicholson recalled living in the cottage years ago when it had no hot water and the couple heated the bedrooms by cutting a hole in the ceiling on the first floor. Other traditions are more personal. Mr. Cleasby’s wife, Marietta, spends the morning and afternoon of each Illumination night doing a themed painting of the Camp Ground. This is a tradition she has kept for close to 50 years. “I paint all day long and I finally raise my head and I look up and I go ‘Gosh, it’s 6’o clock!’ and then I have to hurry to get over here,” she said. This year, Mrs. Cleasby chose to paint the front of the Tabernacle. Mrs. Cleasby also had the honor of painting the lantern that Mr. Nicholson lit, going the lantern with an image of the Tabernacle as well. 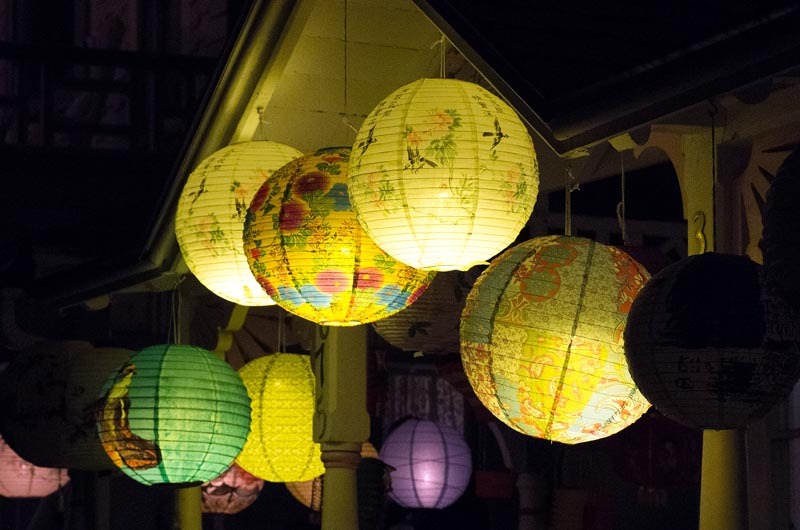 As people strolled around the beautifully lit neighborhood, they enjoyed a mix of lanterns both modern and old-fashioned. Some lanterns, like the ones that decorated Steve and Dawn McKenna’s house, date back to the mid 1800s. Though Mr. McKenna is not certain of the lanterns’ exact ages, he’s been able to make a pretty good estimate by looking at how the American flag is painted on the lanterns. Though Mr. and Mrs. McKenna have owned their house, which is pink with aqua trim, for 25 years, these lanterns have stayed with the house since it was constructed, as per tradition. Before the McKennas purchased the property, the house had been in another family, the Chase family, for 100 years. Mr. McKenna said that his favorite part of Illumination Night is the anticipation of seeing the first lantern lit and travelling down the aisle at the Tabernacle. and knowing that he has to begin lighting his lanterns. “We light them one at a time because they’re all candles, so it’s that anticipation of when do we start the first one,” he said. And the first one, Mrs. McKenna said, is always special. The second year that they owned their Camp Ground home, Mrs. McKenna painted a picture of their house on one of the lanterns. At the McKenna home, that lantern hangs in its place over the porch stairs, and it is always the first one lit. Photo gallery: Grand Illumination Night Stroll. I love seeing the photos and reading about the traditions. My daughter and family have been vacationing there for 16 years now always the week of Grand Illumination Night. I've visited with them there in 2002 and 2004 after spending just a day there back in 1964 on my honeymoon. Martha's Vineyard is a precious island! The Martha’s Vineyard Camp Ground celebrated its 49th annual Grand Illumination Night on Wednesday.